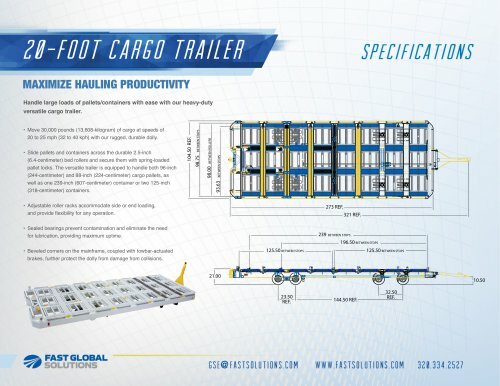 20-FOOT CARGO TRAILER MAXIMIZE HAULING PRODUCTIVITY Handle large loads of pallets/containers with ease with our heavy-duty BETWEEN STOPS BETWEEN ROLLERS BETWEEN STOPS • Slide pallets and containers across the durable 2.5-inch (6.4-centimeter) bed rollers and secure them with spring-loaded pallet locks. The versatile trailer is equipped to handle both 96-inch (244-centimeter) and 88-inch (224-centimeter) cargo pallets, as well as one 239-inch (607-centimeter) container or two 125-inch (318-centimeter) containers. • Move 30,000 pounds (13,608-kilogram) of cargo at speeds of 20 to 25 mph (32 to 40 kph) with our rugged, durable dolly. versatile cargo trailer. • Adjustable roller racks accommodate side or end loading, and provide flexibility for any operation. • Sealed bearings prevent contamination and eliminate the need for lubrication, providing maximum uptime. 239 BETWEEN STOPS 196.50 BETWEEN STOPS 125.50 BETWEEN STOPS • Beveled corners on the mainframe, coupled with towbar-actuated brakes, further protect the dolly from damage from collisions.